One of Wyoming's eminent artists, Neltjes (American, b. 1934) abstract expressionist works are, in the words of the artist, an exploration of making the sensed visible, defining moments, and balance the interior reality of passion with the external condition of form. 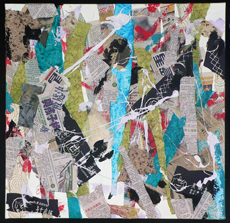 A prolific artist, Neltje explores new directions in combining text, objects, and torn paper into compositions. Neltjes work is rooted in movement and gesture. Her early works, in the form of sumi-e, a characteristically Asian style of brush painting similar to calligraphy, allowed her the freedom to experiment with line and motion. As her work evolved, she found inspiration in the work of other abstract artists like Jon Schueler and Joan Mitchell. 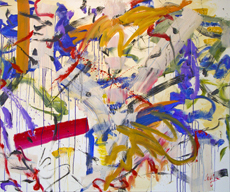 Their bold approach to color and making distinctive marks on the canvas influenced Neltjes own creative process. Her most recent paintings incorporate paper, text, and found objects and like all of her pieces, these new works also tell stories. By using colorful papers and newspapers from her many travels, and objects from friends and colleagues she creates work that is personal and multi-layered. Her compositions balance the freedom of gesture with formal shapes and lines. Funded in part by the WESTAF and the National Endowment for the Arts, which believes a great nation deserves great art. Neltje, an abstract expressionist and one of Wyoming's eminent artists, uses veiled images and layered compositions to represent themes of nature. In this UWTV feature, Neltje explores Wyoming's influence on her life and her work.